Cazadores Extra Añejo is a limited edition, 100% Blue Agave Tequila aged for 3 years in new American oak barrels. Tequila Cazadores Agaves are sliced and steamed in a stainless steel autoclave for 10-12 hours, then heated, grinded, & diffused. An all natural 7 day fermentation process begins afterwards, to the sounds of Mozart, Symphony No. 40. It is then double distilled in stainless steel pot stills. Cazadores, Spanish for "hunters", symbolizes Señor Jose Maria's constant pursuit to create the world's finest premium Tequila. The deer was placed on the label because Señor Jose Maria loved to watch the deer run majestically through the Agave fields. My favorite everyday sippin' tequila--when I can find it. Nice agave aroma; agave, vanilla, oak flavors; smooth with little tequila "bite." Enjoy this after dinner with a fine cigar and good friends! Not always easy to find, so grab it when you can. So, I am in this well-known mega-chain wine and liquor store in New Jersey and I see this bottle on the shelf. It comes in a beautiful presentation box - and the price was right ($80). So, I bought it. I didn't even know that Cazadores made an extra añejo - so it turns out this is their first excursion into these uncharted waters. Of course, everyone is familiar with the distillery in Arandas and it has been owned by Barcardi for some time. To me, the products from Cazadores taste more like La Valle tequilas than Los Altos. This tasting was going to be interesting. I like sweeter tequilas, so my favorites are heavily skewed toward Los Altos. Right off the bat, the price and presentation were really great. But, it's what's inside that counts. In a tasting glass, there is a dark rich copper color. The legs are thick and drain slowly to the liquid's surface. Did not notice any pearling. On the nose, there are multiple elements competing for dominance. I detected vanilla and agave with some fruity undercurrents. First taste is smooth with spicy accents - plenty of alcohol - but also quite sweet. Subsequent tastings evolve into more subtle flavors such as allspice with oak and a little smoke. Plus, it goes without saying, more vanilla. The tequila is fairly viscous, coating the mouth completely. Upon further sipping, the flavors intensify and the alcohol level ceases to be noticeable. A little sangrita between sips and with good friends, good food and good music - a person could drink this all night. 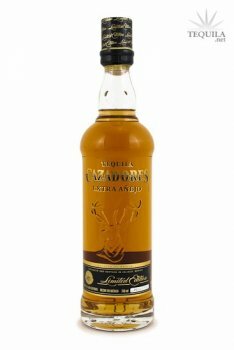 It's the best Cazadores offering I have ever tasted. But, as with most extra añejos - it's a limited edition. Get it soon or you might miss it. So - I put this tequila right in the middle - between the highlands and the valley. Aged for three years but there is very little barrel influence. It's a surprise well worth trying. I don't love Cazadores as a brand, but the price was too good pass up for an extra anejo. NOM #1487 makes good, but unspectacular tequilas. This is their first crack at an extra anejo, so I figured it was worth a shot. Aroma: Nice agave nose for an XA. Complimentary notes of oak and vanilla. Initial Taste: Excellent entry. Lots of vanilla sweetness and spices (predominantly cinnamon). Wow. Body: Nice think body. Agave and pepper flavors combine with oak, vanilla and cinnamon to make a wonderful dessert-like flavor. Almost like a good custard. Finish: Medium finish, but all the good flavors stick around. This is all around excellent. Well done Cazadores! Honestly, I'm shocked. I'm sitting back here right now just craving another pour. This is an excellent and well thought out extra anejo. I highly recommend this one. The only real knock is that I've never cared for the Cazadores stag or bottle. Who cares when the juice is this good?